A professional kitchen cannot function without a proper microwave oven! As for any other equipment purchase, being familiar with the range of available products will make your decision easier. Amana offers a wide variety of products for any size kitchen, from small coffee shops to large restaurants. They offer different sizes and wattages to suit any commercial kitchen. Remember, residential microwave ovens are not designed for use in professional kitchens. Choosing the perfect equipment mostly depends on how you intend to use it. Do you operate a large restaurant, a coffee shop, a bar, a grocery store, a convenience store, a concession, or a cafeteria? The following advice will help you choose the best option according to your needs. These products are perfect for fast-food restaurants, bars, small restaurants and prep stations. Small coffee shops, grocery stores, and fast-food restaurants will find the ideal microwave solution within this series. 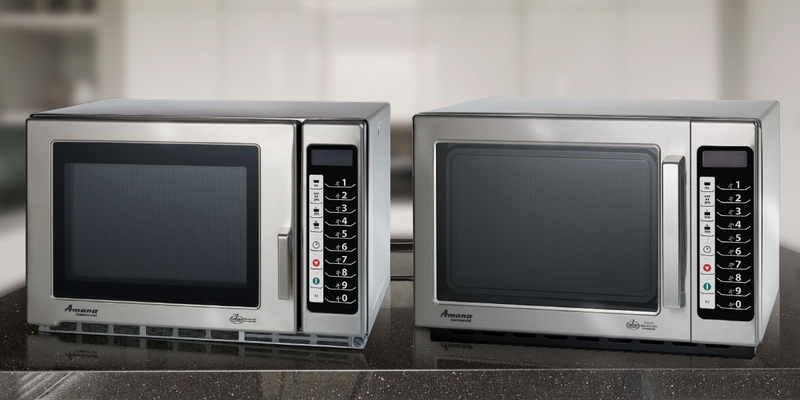 This range of microwave ovens is ideal for convenience stores, dessert stations, hospitals, coffee shops, teachers' lounges, and fast-food restaurants. Whether you operate a large scale restaurant or a fast-food chain, choosing the right microwave oven is a serious affair, just like any other equipment purchase! Our knowledgeable and experienced team has the expertise to help you. Contact us for more information, it will be our pleasure to answer your questions and help you make an informed decision according to your budget and needs.